When Lifelong Pathways meets with a family for the first time, there are usually many questions around what each “support category” means. We would like to explain what a support category is, what each of them mean and to provide some examples of how the funding in each support category may be utilised. Core supports are to assist a participant to complete activities that are essential for their daily living and helps them to work towards their goals. Capital supports are a specific item or change to the physical environment that is required due to a person’s disability and helps them to work towards their goals. A capacity building support is a support, service or activity that enables a participant to build their independence and skills. In the case of capacity building supports, some of the supports may be to assist the participant’s nominee rather than the participant themselves, such as Support Coordination. The first is Daily Activities, which may include assistance at home with essential tasks and respite in the form of assistance from a support worker. The second type is Transport, which is funding for the transport costs associated with accessing activities such as education and work. For example, if you are unable to use public transport. Another type of core support is Consumables. This is specifically related to equiupment such as continence aids (e.g. nappies and catheters) and eating and drinking needs (e.g. Bolus syringes and HEN pumps). Finally, there is the Social Community and Civic Participation, which is assistance to enable a participant to access activities in the community. This may be in the form of a support worker to enable to access the activity. The NDIS may fund the cost of some activities for a period, but the participant is expected to be responsible for the ongoing costs of the activities. There are two types of capital support categories. The first is Assistive Technology, which is for equipment related to areas such as those shown in the table below. Household Tasks Adapted clocks, adapted dishwashing aids. Sleep Electronic beds, bed rails. Bathing & Toileting Commodes, shower chairs. Communication Communication software, voice generator. Hearing Cochlear implant accessories, adapted smoke alarms. Vision Tactile computer display, braille printer. Mobility Custom footwear, wheelchairs and accessories. Vehicle Modifications Hoists, ramps, adapted steering systems. The second capital support category is Home Modifications, which is for physical changes in the home environment, such as grab rails and ramps. 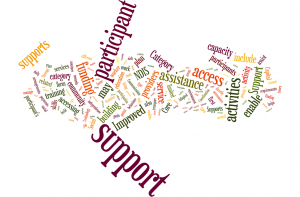 The most diverse group of support categories is the capacity building supports. There are several of these, and a brief description of each is provided below. Support Coordination – Is assistance provided directly to the participant (or their nominee) to enable them to effectively and independently use an NDIS plan. Services may include, but are not limited to, accessing the NDIS portal, finding and making agreements with service providers and resolving issues with service providers. Assistance is not limited to funded supports in a participant’s plan, and a support coordinator may also assist with accessing mainstream supports (such as education). Improved Living Arrangements – Is assistance to access or retain suitable accommodation. It can also include applying to rent a property and assistance to ensure that a participant complies with the requirements of a rental agreement. Increased Social and Community Participation – Is different from the Social Community and Civic Participation in core supports. This support category is assistance to build a participant’s capacity to access community and social activities, such as attending appointments, go household shopping, and to attend social activities. The support must have a capacity building component, that is, building the skills and independence of a participant. This is why it is different to a support worker accompanying a person to an activity. Finding and Keeping a Job – Is funding to access services such as training to adjust to and manage job demands, and assessments to determine modifications required to work environment or tasks.. Improved Relationships – Is to enable a participant to have behaviour support plan to address harmful or concerning behaviours, and then to enable everyone who is directly involved with this participant to access training on the behaviour support plan. Improved Health and Wellbeing – Is to enable a participant to access services such as a personal trainer or exercise physiologist. This also include dietetics and advice on managing dietary issues. Improved Learning – Is a support category intended to assist a participant to move from school to further education, such as University or TAFE. This support enables participants to access assistance with coordinating arrangements and orientation. Improved Life Choices – Is funding for the Plan Management of a participants NDIS funding. This includes services such as paying service providers, liaising with service providers and claiming reimbursements for payments made to providers from the NDIS portal. This is an overview of some ways in which the funding in each support category can be used. If you are unsure it is always best to check with your Support Coordinator and/or Plan Manager, or the NDIA itself, before accessing a support. As a leading children’s service provider in South Australia, we have referred numerous families to Lifelong Pathways at times of difficulty or conflict with NDIA or when Internal Reviews were required. Joanne has been able to successfully negotiate with the NDIA resulting in improved outcomes for children and their families. She has at all times been professional, organised and highly committed to assisting each family, based on their own unique circumstances. We have no reservation in recommending Lifelong Pathways to families that need assistance when liaising with the NDIA and for preparing for planning meetings and plan review meetings. Furthermore we will be liaising with Lifelong Pathways as our service provider of choice for Coordination for Supports and Plan Management for NDIS support plans. Copyright © 2015 - 2019 Lifelong Pathways. All Rights Reserved.